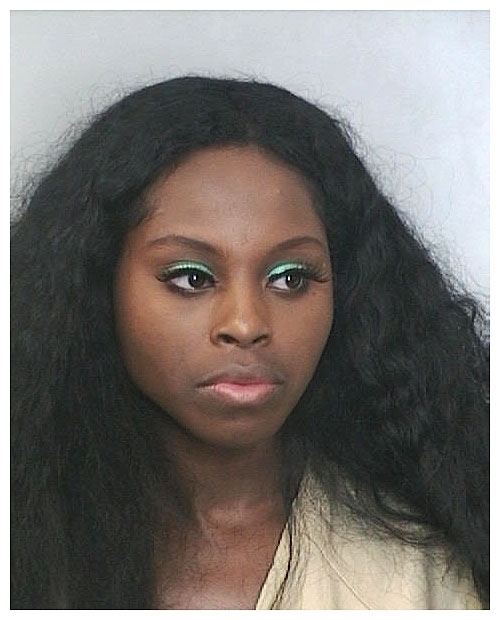 Inga Marchand, better known as the rapper Foxy Brown, was arrested in February 2007 after she allegedly went nuts at a beauty supply store in Pembroke Pines, Florida. According to police, an employee of Queen Beauty Supply spotted Marchand 'utilizing beauty products' in the store's bathroom and told the performer that the shop was closed. The temperamental Marchand allegedly responded by spitting on the worker and throwing hair glue at him. When cops responded to a 911 call, Marchand swatted an officer's hand away and began 'swinging her arms and struggling' with the cop, who was 'forced to utilize a takedown maneuver to gain control' of the rapper. Marchand was charged with battery and obstruction of justice and was booked into the Broward County lockup, where a sheriff's representative snapped the above mug shot. Submitted by SpecialEd on Thu, 2011-06-02 23:22. "I gotta have my eyelash glue! If I dont get my eyelash glue, I'm going berserk!!" Submitted by nastynorm on Sat, 2010-12-11 00:40.